Hello everybody and welcome to this edition of SW & C Jackson Life. Through this periodic newsletter, I hope to keep you abreast with practice life, offers you may be interested in and interesting optical titbits. Hopefully the winter weather is now behind us and we can enjoy the longer days and not having to scrape the cars free of frost in a morning. We normally do not get snow or ground frosts on Anglesey being so close to the sea, but this winter I have had to abandon my car at the bottom of our very steep driveway on a couple of occasions as it had turned itself into the North Face of the Eiger! I was delighted to see some daffodils that I planted last autumn coming into bloom – I think they are the most cheerful of spring flowers. 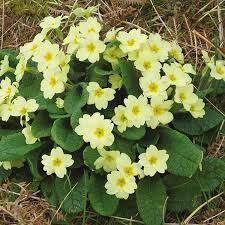 I was however even more pleased to see that a primula that my mother had given me had made it through the winter. This particular plant came originally from my grandmother’s garden and over the years has been lifted and divided and passed from garden to garden. Mum gave me a small pot with it in last September, I planted it and then it vanished! Thankfully it appeared to be merely getting settled in to its new surroundings! Those of you who have visited the practice over the past couple of months may well have met Kate Jenkins our new dispensing assistant. Kate approached me because she was relocating from Cumbria to the Nantwich area. An experienced dispenser she was looking for a position in an independent practice. She came to the practice for a chat and the rest, as they say, is history. Kate is a pleasure to work alongside. She is lovely with all our patients and she never stops smiling! Dry eye is a perfectly miserable condition which can affect anyone but is more common as we get older or have certain medical conditions such as arthritis. Symptoms of dry eye can include burning and stinging of the eyes, excessive watering and intermittent blurring. Dry eye suffers find that their eyes are frequently red and sore looking and often they find their eyes run for no apparent reason. Dry eye occurs because some of the glands that manufacture the oily part of the tear film stop working. Without the oily phase, the watery tears quickly evaporate leading to dry spots on the eye which causes burning sensations and blurring of the vision. These accessory glands can be encouraged in some people to work again through a combination of warm compress bathing and gentle massage of the eye lids. For a lot of people however, the only way to regain their ocular comfort is to use ocular lubricants. There are many on the market but I prefer the non-preserved versions as there are no strong chemicals within the drops to cause further aggravation to the eyes. My personal recommendations are the Hycosan range or Thealoz. The Hycosan range comes in a number of different viscosities to help people with mild, moderate and severe dry eye problems. Each bottle stays fresh for 6 months from opening. Thealoz contains the most modern ingredients for the treatment of dry eye and has the advantage of coming in a soft bottle which is easily used by those with arthritis in their hands. Recently, diet has been suggested as a way of helping control of dry eye symptoms. A diet rich in oily fish such as salmon, sardines and mackerel may help improve ocular comfort. Optical Coherence Tomography is almost here. I have wrestled with myself over the past 18 months over whether to purchase an Optical Coherence Topographer – OCT for the practice. OCT is the most up to date laser scanning technology available for detection and monitoring of eye disease and is usually only available in hospital eye departments. OCT is particularly useful in detection and monitoring of glaucoma and age related macula degeneration – AMD. Three weeks ago, my husband Robert and I attended Optrafair, the annual trade fair for Optometrists in Birmingham By the end of the day I had arranged the purchase of a new sight test chart (the old one sadly has died) and an OCT, not to mention having made a number of useful contacts for some exciting new frame ranges – more of this later. I have had to undergo a training course in the interpretation of OCT scans in order to have the equipment. This training will be ongoing to keep up my skillset. The staff will also have to receive training and we will have to re jig out diary a little to allow time for both scanning and discussion, hopefully however, before too long we will be able to offer OCT to everybody. We think that OCT is so important that we will be offering as standard as part of our private NHS examinations. Unfortunately the NHS sight test will not cover an OCT scan but we are delighted to be able to offer it to all of our NHS patients for an additional fee. At the practice we have been on count down for the past few months as on the 9th June, practice manager Jo is getting married to partner Simon. It’s been better than Coronation Street! We have had all the ins and outs of the dress, the modification of the neckline, with a veil or without? And let’s not even mention the shoes…….. However, all will be well on the day, the flowers will be beautiful, groomsmen pristine and the bride radiant! Jo and Simon have been so kind as to invite all the staff and never being ones to turn down a free lunch, we will all be in attendance to wish them every happiness for their future together. We saw Coco Song at Optrafair and fell in love with these beautiful ladies spectacle frames. Each frame is individually hand made in Italy the process taking over three months to complete from start to finish. Each frame is one of a run of only 500 pieces and contains a sheet of real silk along with dried flowers, ostrich feather or hen’s feather. Any metal trims are plated with either yellow or rose gold and some frames have semi-precious stones set on the sides. The colours range through subtle muted tones right through to vibrant pinks and purples. They are very different to anything that we have ever stocked before – each one is a piece of design in its own right. If you are interested in viewing the collection, please call to make an appointment. The other frame range we decided to stock off the back of visiting Optrafair is Ronit Furst which have lately been sported by Pru Leith on Bake off! and Question Time. Ronit Furst is a skilled ceramics decorator who wanted spectacles for herself that were individual and conveyed her personality and so her range was born. Characterised by their bright colours and hand painted individuality, Ronit Furst frames have become popular amongst those who value individuality and want their specs to convey something of their personality. We will be stocking a selection that we found particularly appealing and these will be available from stock. All frames however can be personalised for example by specifying matching or non-matching side colours or having the coulour design on a different eye shape. These bespoke pieces will be available at no extra charge but will take about 4 weeks arrive with us as they are hand painted to order. Essilor Multi Pair Offer extended. 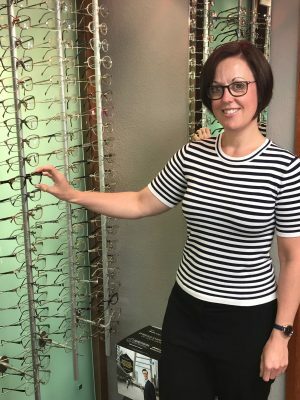 This has been extended so if you would like to buy two pairs of spectacles, for a limited time you can get your second pair of spectacle lenses half price. This is a great offer for those wanting sunglasses! We had a patient collect her new polarised sunglasses last week. She rang us back the day after collection to say how delighted she was with them and how she had never experienced such visual comfort in the sun before. We all need to get better at wearing our sunglasses as UV helps to cause both cataract and age related macula degeneration. Polarisation makes it easier to wear sunglasses more of the time. Our Nautilus Lens Demonstrator has a really good simulation of the difference between tinted and polarised lenses. If you would like a demonstration please ring the practice and we can book a short appointment to show you. As I write, I am yet again sat in a sailing clubhouse while Felix Struts His Stuff on the water. This time we are at Rutland Water in Leicestershire at the Eric Twiname Championships. 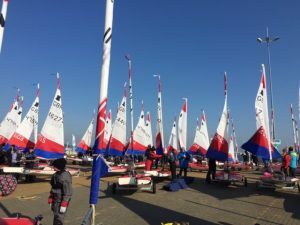 This is a special annual event run by the Eric Twiname Trust to support the development of junior and Youth sailing in the UK. Felix is sailing in the Welsh Squad or should I say currently floating as there is absolutely no wind out there! Look out for Myles – not a Dry Eye in the House! Myles, son of Jo our Clinical Manager, recently took the role of Knuckles in a local production of Bugsy Malone to much acclaim. The Curtain Call Productions musical ran at the Crewe Lyceum for several nights and was well attended. Myles has other irons in the fire and will be appearing in a couple of other production in the autumn – more details to follow in the next edition. If you are on Facebook, Why not visit our page @SW&C Jackson Opticians. 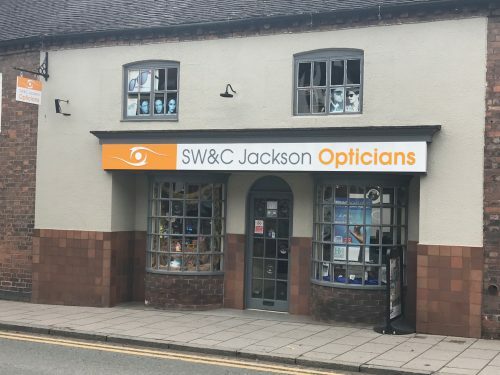 We post all sorts including eye health information, special offers, practice news and insights as to what we all get up to when we are not at work.